At Citrix, we believe in educating you about our products just as much as we do about empowering your businesses with them. That’s the driving force behind our multifaceted efforts to provide you with comprehensive product documentation, the Citrix Knowledge Center with its thousands of articles, and a community forum where Citrix employees, CTPs, and other users come together to share knowledge. This, however, creates a challenge. When you have a product-related question, where do you search first? We decided to eliminate the confusion. 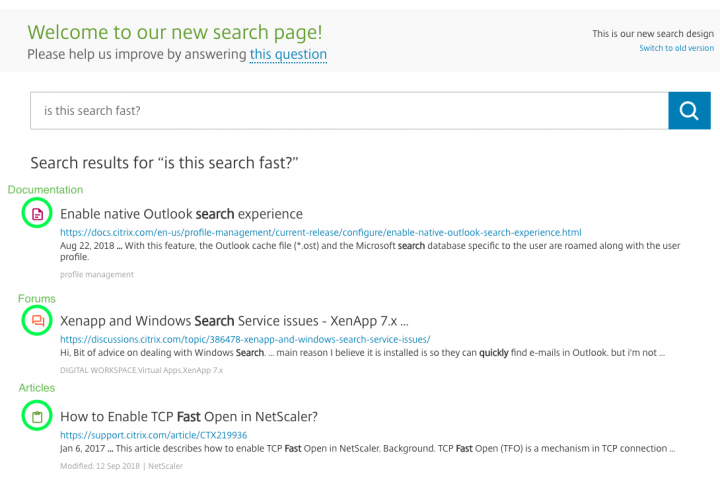 Citrix Support has redesigned and re-engineered our search to bring you results from Citrix Product Documentation, Citrix Knowledge Center, and Citrix Discussions to a single location. You no longer have to figure out where to begin your search, and you don’t need repeat the same search on all three sites. Visit support.citrix.com to try it out now! Keyword Highlighting: Your search keywords are highlighted in the results. Search Operators: You can use “Search Operators.” For example, you can type “XenDesktop Configuration filetype:pdf” to see only search results from PDF documents. You can find the complete list of search operators here. Give it a look. You might even learn a thing or two that you can use in your everyday Google searches! The majority of our articles are generated from actual support cases and describe issues the way our customers reported them. For better results, briefly describe your issue in the search field. We did remove product filters, which were rarely used, but you can still search by product. Just include the product and version numbers in your search. We hope this improved search tool will help you get the information you are looking for quickly and effortlessly. And we would love to hear your feedback. Please use the built-in survey on the search page to share your thoughts!